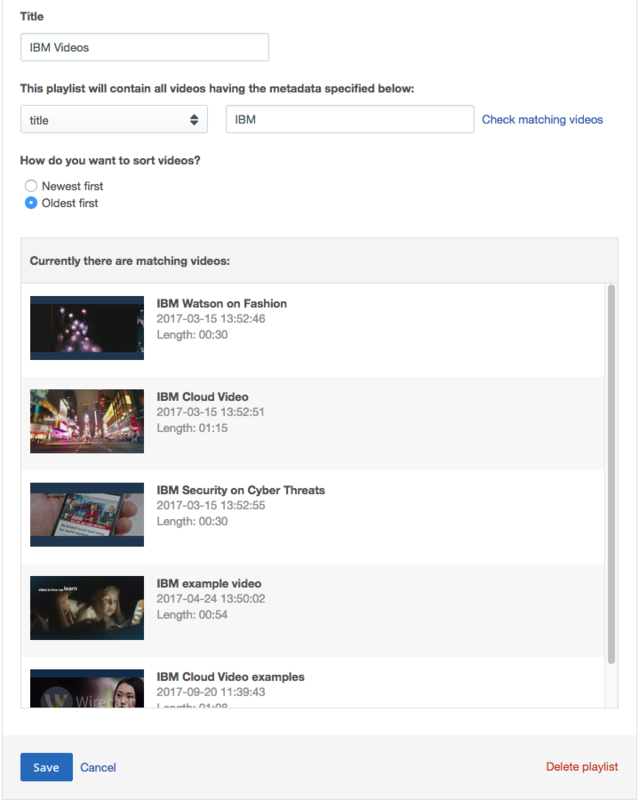 Video playlists enable content owners to categorize their videos and share video series on their Ustream Pro Broadcasting and IBM Cloud Video Streaming Manager channel pages. You can create Regular playlists, or Dynamic playlists, but the viewing experience is the same for the two kinds of playlists. To create a playlist, a content owner simply has to click on an existing channel inside their account and go to the Playlist option. There will be an option to create a new playlist on this page, which requires giving it a name. 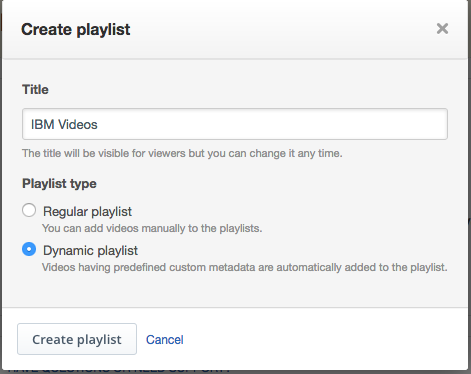 Choose the "Regular playlist" option to be able to select and reorder videos in the playlist manually. After naming the list, the content owner next chooses the videos to add to the playlist. Due to the fact that accounts can have hundreds if not thousands of videos, a search option has been added for easier location of assets. The search will locate any asset on the account that matches the word or phrase. For example, a search for "Demo" would pull up a video called 'User Experience Demo'. However, a search for "User Demo" would not pull up the same asset as the two words do not appear in that sequential order. Note that only published videos can be added. Unpublished videos will still appear, but will be unable to be added to a playlist until they are published. Furthermore, if a video is later unpublished a prompt will appear warning that doing so will remove it from all playlists, providing a list of impacted playlists before being unpublished. Numerous playlists can be added to a channel. As seen above, each will be listed using the thumbnail of the first video along with a chosen name for the playlist, length and total number of videos located inside. Creating playlists using the regular method is very effective, but may be difficult to sustain when you are working with dozens of videos- you may not have the time to re-create playlists. In this case, we have also introduced the Dynamic playlist feature. With Dynamic playlists, playlists can be automatically generated and updated based on data associated with each video. We can see that there are multiple videos that have to do with IBM products, and some videos that aren't. First, click on the 'Playlists' tab in your channel settings, and (if you have never created one on this channel) click 'Create your first playlist'. Give your playlist a title, and then click 'Dynamic Playlist'. In this case, we are naming our new playlist 'IBM videos'. Then, click 'Create playlist'. In the next panel, you will choose what criteria is used to search for relevant videos to add to the playlist. You can select videos based on information contained in the title of the video, information contained in the description of the video, or by custom metadata type that you have put in place for your account. 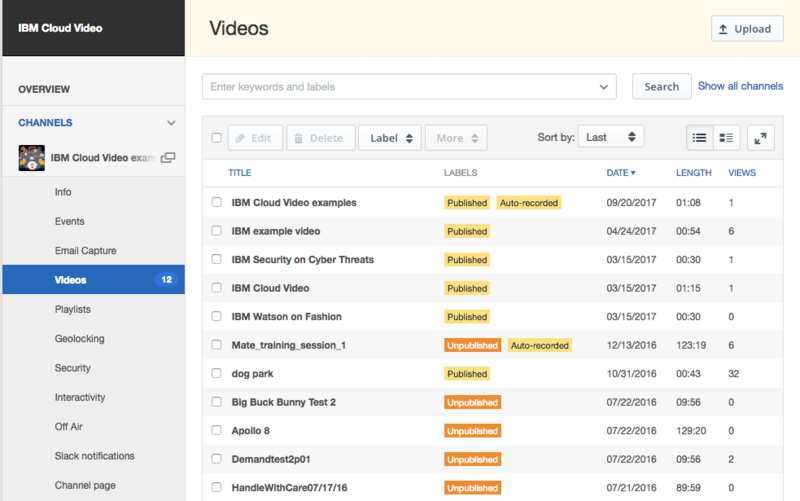 In this example we will use the video title, and search for the string 'IBM'. You can then click 'Check matching videos' if you would like to see a list of the videos that will appear in the playlist. If you feel some videos are appearing that should not be (or some videos have not appeared), re-check your search criteria. If you are happy with the playlist, click 'Save'. After clicking save, you will be returned to the Playlists tab for your channel, where you can see your new playlist. Because the playlist is dynamic, any new videos added to the channel that meet the criteria you set for your playlist will automatically be added to the playlist. Just as with individual videos, you can make changes by hovering over the playlist and clicking on the dropdown arrow on the right side of the playlist row. By default, even after playlists have been created, they are turned off for a channel. A prompt is provided notifying account owners of this, making it easy to turn them on or to continue creating playlists in a "staging-like environment" before turning them on for viewers. Once enabled, though, a new tab is added to a channel page called "Playlists". This listing allows viewers to browse curated playlists created by account administrators and channel managers. Once a playlist is selected, a new "Playlist" listing appears to the right of the player. The listing states the name of the playlist, number of videos, total duration and cites what videos are inside. This allows viewers to see what's coming up, when it was added and the ability to switch to a video of their choosing in the playlist. When a video in the playlist is done, the next video will immediately start to play.